GAYA: Two CRPF jawans were killed and 10 injured, three of them critically, when Maoists blew up a mini-bus carrying them in here yesterday evening. Bihar Director General of Police PK Thakur said that the ultras planted a landmine on the route taken by the security personnel, police and CRPF, in Imamganj-Dumaria area during anti-Naxal operation. He said, the landmine exploded when the mini-bus came over it. Inspector General of Police (Operations) Sushil Khopde said two CRPF jawans belong to elite CoBRA battalion, were killed and ten wounded in the attack. The condition of five injured is stated to be critical. While four of the five seriously wounded were taken to Ranchi, another was flown to Patna. Mr Khopde said, 30 lakh rupees will be given to each of the families of the deceased jawans. 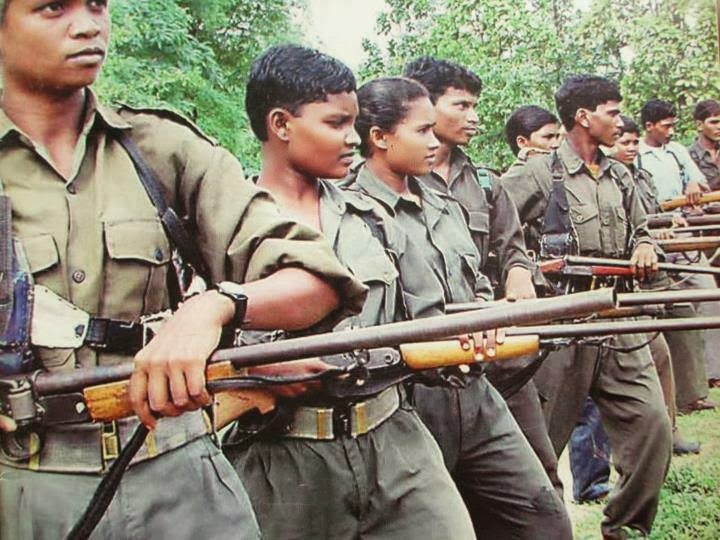 The outlawed Communist Party of India (Maoist) has accused the Bastar police of killing 26 “civilians” and three “political workers” in fake encounters in the last one year in different parts of Bastar. In a press statement sent to The Hindu , the south regional committee (SRC) secretary of the CPI (Maoist), Ganesh Uike, alleged that 20 “civilians” were killed by the police and paramilitary forces in Bijapur district of Bastar between January 2014 and January 2015. “Five civilians were killed in fake encounters in Sukma district, and one villager was killed by the police in Dantewada district. All of them were later declared Maoists.” He said three of his party workers — Jamali, Rambatti, Lakshmi — were also killed in staged encounters. “In the name of containing Maoism, security men are violating human rights of Bastar tribals,” he added. “A rough estimate indicates that 15,000-35,000 people live under the threat and fear of arrest warrants in Bijapur alone. Instances of sexual torture of tribals were also noted. In flagrant disregard of international covenants, the security forces deliberately regard passengers in local transport as ‘human shields’ during possible encounters,” the report said. Blaming the police camps for affecting the living conditions of tribals, the report said the present situation was comparable to, and a continuance of, the Salwa Judum activities: eviction and mass displacement of villagers from 2005 to 2009. The outlawed Communist Party of India (Maoist) damaged a railway track near Kamalur station in Dantewada district of Chhattisgarh on Thursday, leading to the derailment of a goods train engine. The driver and helper of the engine suffered minor injuries in the accident. The Maoists have called for a ‘Dandakaranya Bandh’ on Friday in protest against the Polavaram Dam project and the “All-out war” by the Government of India to “flush out Maoists from Bastar.” “The Polavaram Dam project will displace 2.5 lakh Dorla Tribals from different parts of Bastar and Telangana. To oppose this project, our Central Regional Bureau has called for Dandakaranya Bandh on February 20. We appeal to the people of Telangana, Orrisa and Dandakaranya to observe strict bandh on February 20,” said Ganesh Uike, Secretary of the South Regional Committee (SRC) of the CPI (Maoist) in a statement sent to The Hindu. 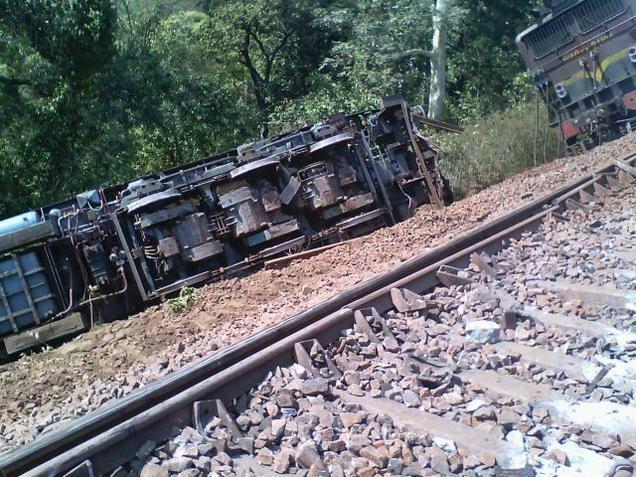 In an effort to enforce the bandh, the ultras damaged the railway track. Accusing the State police and the Central Reserve Police Force (CRPF) of “oppressing and harassing” the Tribals of Bastar in the name of “anti-Maoist operations,” the Maoist leader also claimed that the police arrested three “workers” of the CPI(Maoist) on February 5 from Kotrapal village in Bijapur district. “Mallesh, Podyami Sukhram and Madavi Lachhu were picked up by police from their homes. All three are being tortured inhumanly in police custody and are being forced to join police as ‘Gopniya Sainik’ (secret agents). We demand that all three be produced before the court immediately,” the SRC secretary said. The Maoist leader also accused the police of arresting two villagers from Bodali village in Bijapur and not disclosing it to the media. “Police and CRPF are going on rampage in many Bijapur villages. People from interior villages are scared to go to market places because common villagers are being arrested as ‘Warrantee Maoists’ and are being forced to surrender,” Ganesh Uike said while expressing solidarity with the teachers, laborers and Anganwadi workers of Chhattisgarh. Raipur: A Special Task Force jawan was killedin an encounter between security forces and naxalsin Chhattisgarh’s insurgency-hit Dantewada district on Thursday. The face-off between a joint team of security personnel and maoists took place in Dudhiras village under Gadiras police station limits, Dantewada Superintendent of Police, Kamlochan Kashyap said. A contingent ofSTF and district force was mobilised from Gadrias in the interiors forests, located around 400 km away from here. When they reached Dudhiras forests, after cordoning off some 18 km, a group of armed cadres opened indiscriminate firing on them leaving a jawan dead, the SP said. 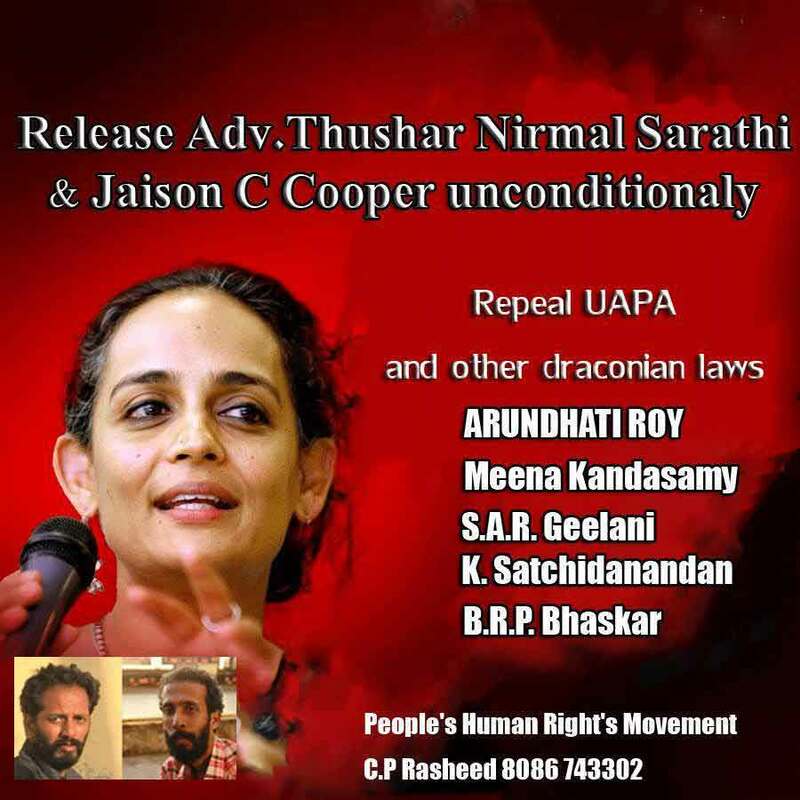 KOCHI: The relatives of activists Thushar Nirmal Sarathy (36) and Jaison Cooper (37), booked under the Unlawful Activities (Prevention) Act (UAPA) for Maoist links, have accused police of highhandedness. Thushar’s wife Uma said she was barred from the district court premises on February 6, on orders from police officers, when the case was taken up. She was also not allowed to give some books to him, on the grounds that he could only read whatever was available at the prison library. For 17 hours over Monday and Tuesday, traffic on the national highway that connects Chhattisgarh to Andhra Pradesh came to a grinding halt. More than 1000 adivasis, both men and women, blocked the highway in protest against the arrest of Mutchaki Hadma, a primary school cook. The protestors brought food and utensils, pots and pans, and sat on the highway, determined to not budge till Hadma was released. The protest started gathering steam in late afternoon as people from eight villages clustered outside the Tongpal police station where Hadma had been detained. Not only did people come from the Chhindgarh block of Sukma district, where Tongpal is located, but also from the Darbha and Kuakonda blocks of Dantewada district, many walking more than 20 kilometres. 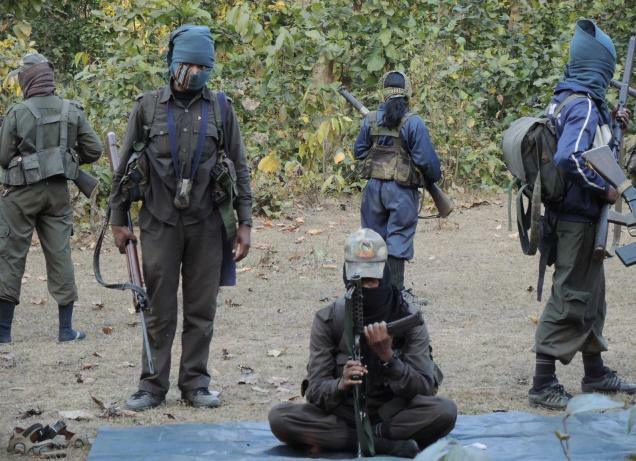 Sukma and Dantewada districts are part of the Bastar region in southern Chhattisgarh, where armed Maoist guerillas have been fighting a prolonged low intensity war against the Indian state for more than three decades. The last decade has seen a heavy influx of government security forces in the region. Viewing local people as agents and supporters of the insurgents, the police and paramilitary forces carry out searches and interrogations in the villages, which have created a heightened sense of anger and resentment. Hundreds of students from Jawahar Lal Nehru University marched to the Maharashtra Sadan in New Delhi, on Monday demanding immediate release of Hem Mishra. Mishra was arrested in August 2013, on charges of being a ‘Naxal Courier’. Mishra has been former student of the university, a cultural activist and former leader of Democratic Students’ Union (DSU). The protesters speaking with iamin said the march was organised after Mishra was again denied bail by a Maharashtra court on February 5. Logded in Nagpur jail, Mishra has been booked under Unlawful Activities (Prevention) Act (UAPA). 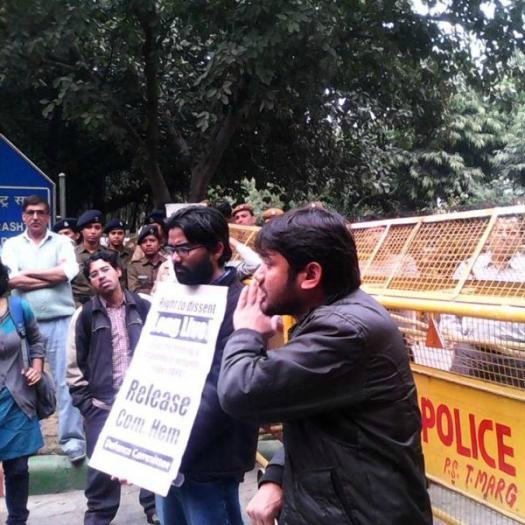 The ex-JNU student has denied all the charges levelled against him. He had also written a letter to his friends and family from Nagpur jail last year mentioning that he was being tortured on daily basis.